The early Rockwell painting was created for the cover of the April 24, 1926 issue of “he Saturday Evening Post” and has resurfaced in recent years in the form of artistic homages and parodies. It was the inspiration for a very popular Google Doodle, presented by the web search engine in honor of Rockwell’s birthday on February 3, 2010, resulting in over three million worldwide visits to the Norman Rockwell Museum website. The painting is now on view at the Museum, located in the artist’s hometown. Millis traveled to New York and met with the gallery’s curator, who showed him the works on view. “I was just in awe of the Rockwell paintings, and all of the sudden I saw this one, Puppy Love, and I asked if it was for sale, and he said it was, and I said ‘Oh my goodness!” Then only 26 years old, Millis asked the curator if he could hold it for him until the following Monday when he could send a check, to which the curator agreed. The 24″ x 20” oil on canvas has hung proudly in the Millis household for the last 40 years. 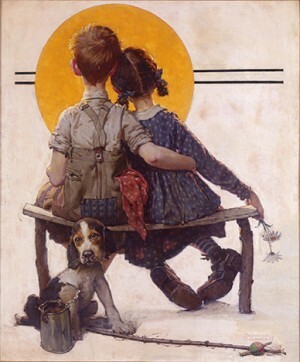 Life’s simple pleasures and the blush of first love are the focus of Norman Rockwell’s 1926 “Saturday Evening Post” cover, which portrays a young couple entranced by the moon, and by each other’s company. Their rickety wooden seating bends under their weight but does not deter them from their reverie, for they are taking time to enjoy the moment. In 1926, Rockwell had already been working for “The Saturday Evening Post” for ten years. A self-proclaimed specialist in painting child-centered scenes, he elevated the status of his youthful subjects by portraying them as complex individuals with dignity, despite their economic status. In this work, Rockwell recalls the pleasures of spending vacations on rural farms on Long Island and in upstate New York, a respite from the bustle of life in New York City, where he was born and spent his youth. His composition invites us to peer over the shoulders of the children who are not aware of our presence. Their simple fishing gear—a branch equipped with line and a blue and orange bobbin (which repeats the artist’s color palette)—has been placed down behind them. Enrapt as they are, they are not aware that their bait is escaping from the can, or that the dog, now a third wheel, gazes longingly out from the canvas.